A 2010 4x4 diesel 3500 Dodge light rescue, EMS-Fire-Rescue command and mobile communications vehicle. This vehicle carries a variety of necessary safety equipment. required NFPA pump, hose and equipment tests are conducted. BLS and other ALS equipment. Stockport and Windsor Township area, but is also used in other areas as needed. with BLS and other ALS equipment. respond to other area's as needed. 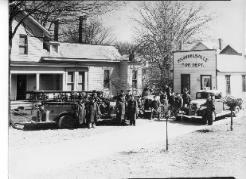 The Malta & McConnelsville Fire Department has been involved in water rescue since the 1930's. Each member is trained and re-trained in the standard operating procedures the department has in effect. Recovery operations sometimes last several days. A 17' fiberglass boat with a 40 horsepower Johnson outboard motor. Boat 2 is a 12' V-bottom with a 9.9 horsepower Mercury outboard motor. Boat 3 is a 10' flat-bottom with oars.